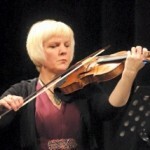 Catherine Martin read music at St Anne’s College, Oxford University, completing her postgraduate at the Guildhall School of Music and Drama, London, studying the modern violin with David Takeno. Catherine now specialises in performance on period instruments and has been the leader of the Gabrieli Consort and Players for the last 11 years. Catherine also leads the orchestra of the Early Opera Company, and has appeared as guest leader of The English Concert and Florilegium. In demand as violin soloist and director, recently Catherine has directed concerts with Barokkanerne in Oslo and the Wroclaw Baroque Orchestra as well as collaborations with amateur and student orchestras on both baroque and modern instruments. Catherine has been a member of the Salomon String Quartet since 2003, exploring music of the Classical period from Haydn to Mendelssohn. She appears on many recordings; for Deutsche Grammophon and Winged Lion with The Gabrieli Consort and Players, EMI with Ensemble Galant, and Chandos with I Fagiolini. Catherine teaches at the Royal College of Music in London.